Most of you know Brian was raised Mormon, and went on a mission to Kyoto, Japan in the late 70's. He came home with a deep love for the Japanese language, culture, and food, and has been dying to take Tim there for nearly as long as we've known each other. So this was more than just a destination. Thank goodness for Japan's incredible rail system. Its high-speed Shinkansen trains are known the world over, and are a source of national pride. But even the tiniest of little locals, bouncing along some pretty bumpy track, still ran like clockwork. For frequency and punctuality, Japan is right up there with France and Germany. And Britain is the only country we've seen that comes anywhere near close to the variety of different train companies and colorful trains. We also can't say enough about the rail passes we bought prior to our trip. They seemed expensive upfront, but saved us literally hundreds of dollars in the long run, and made hopping on and off all kinds of trains pleasantly convenient. Don't go to Japan without one. One final note: Brian's father-in-law, Logan Bryant (known in our household as Poppa) visited Japan during an R&R trip while serving in Korea. He picked up four prints, one for each season of the year. Traditionally, Japanese houses would have a similar set of prints, displaying one at a time, according to the season. Poppa's prints passed to Stacee (and then to Brian) and we had them prominently displayed in our Dublin house. It just so happens that Poppa's prints are all famous landmarks in Kyoto. And while we didn't plan it this way, we ended up seeing all four of these sites on our trip. Included in this gallery are photos of each of Poppa's prints, right next to the photo of the actual place. Day 4: Kyoto - what luck! 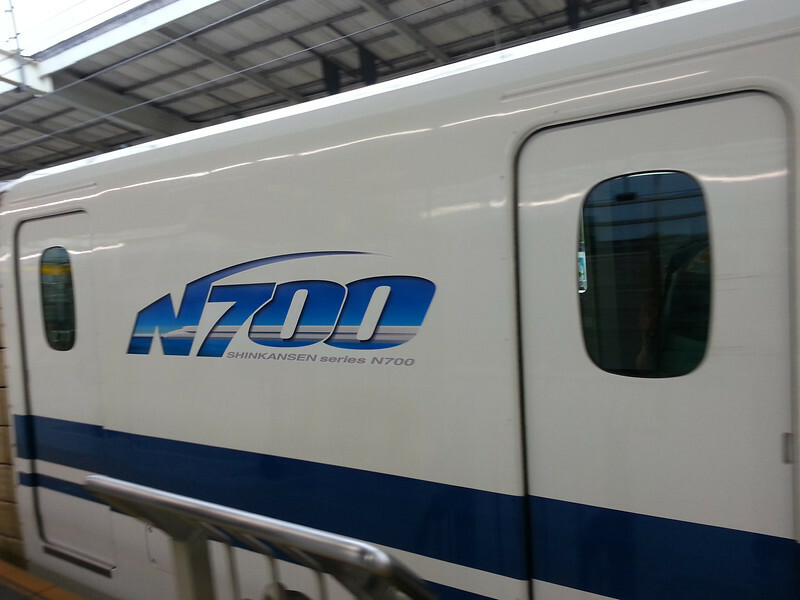 Timmy's first ride on a Shinkansen features the latest and fastest model, the N700.